Reminder: Today is the final day to get in on the free upgrade to Bioware’s Dragon Age 2 Signature Edition when you pre-order Dragon Age 2 . Reminder: The deadline for the Canada Film Centre Cineplex Entertainment Film Program  is January 21st. Reminder: The application period for Canada Summer Jobs 2011  will be from February 1st to February 28th. Since January 2008, many Ontario libraries have been collaborating to provide an online inquiry service called askON , along with a similar French-language service called ONdemande . askON and ONdemande are among the five digital services of Knowledge Ontario , a not-for-profit collaborative. Seven more public libraries joined the service on January 3, so a total of 63 libraries across the province are now participating. Here’s how it works. You go to your local library’s website or to the askON home page  and open a live chat session. After you post your question, a real librarian—not an automated search engine—finds the information you need. The service is available 45 hours a week, and most inquiries take about 10 to 15 minutes to answer. 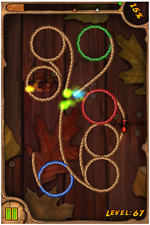 Big Blue Bubble Inc.  has turned the tides in the App Stores war for top selling app with the smash-hit, Burn the Rope , their new original game for iOS devices. After Burn the Rope’s  release last month, it has made a giant leap to the top of the charts in over 50 countries, dethroning best sellers Fruit Ninja and Cut the Rope to sit in the #2 spot in the US and Canadian App Store, right behind Angry Birds. One Canadian title has been named to the IGF Student Game Showcase , and one received an Honourable Mention. First-person puzzler FRACT , developed by University of Montreal student Richard Flanagan , puts the player into an abstract world built on sound and structures inspired by electronic music. The player must then resurrect and revive the long forgotten machinery of this musical world, thereby unlocking the mysteries contained within. Honourable Mention was given to Star-Twine , a title developed at Carleton University. According to the game’s description, “Star-Twine is a strategy game with ambient sounds, unique visuals and a virtually infinite number of levels to play on. Battles take place on three dimensional maps where you, a small point of light, must build structures to extract energy from the threads that make up the world. Energy can be spent on new structures, each with their own unique abilities. The enemy AI builds while you build and reacts to your play-style. This results in challenging battles that require strategic insight and quick thinking.